Houston is synonymous with America’s inspired foray into space exploration, lifting our nation to a world of discovery into “the final frontier” in the 1960s. Exciting and bold leadership fueled by science and the best of sport launched again in the South Texas city on April 14 when USA Football CEO Scott Hallenbeck introduced the Football Development Model (FDM) at the 2019 American Medical Society for Sports Medicine (AMSSM) Annual Meeting. For more than a quarter-century, the AMSSM Annual Meeting has served as a premier gathering of sports medicine physicians and researchers advancing the health and wellness of athletes. A worldwide leader in sports medicine, the AMSSM consists of nearly 4,000 members. 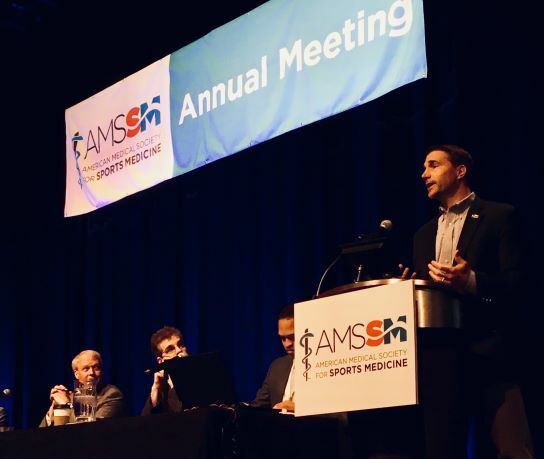 AMSSM leadership invited Hallenbeck to address its members at its highest-attended meeting of the year to introduce USA Football’s athlete-centric development model for America’s favorite sport. The FDM is aligned with the U.S. Olympic Committee’s American Development Model. USA Football is the sport’s national governing body and a member of the U.S. Olympic Committee. Joining Hallenbeck before an audience of more than 1,000 AMSSM members to discuss football’s past, present and future were John J. Miller, a national correspondent for National Review and the director of the Herbert H. Dow ll Program in American Journalism at Hillsdale College; Steve Shaw, the NCAA’s national coordinator of football officials and veteran Southeastern Conference football referee; and Dr. Eric C. McCarty, an orthopedic surgeon and head team physician for the University of Colorado and University of Denver, who also is a former University of Colorado all-conference linebacker. Following Hallenbeck’s presentation, physicians and researchers lined up to meet him and share their enthusiasm for the FDM. Many volunteered to help USA Football introduce the model to youth football programs in their region this spring and summer. “What Scott presented today is football reimagined – it can make football’s future even brighter than its brilliant present and past through smarter play and greater participation across both genders and myriad age groups,” said Dr. Brandon A. Grimes, AMSSM member and moderator of the two-hour football-focused education session. Dr. Mines is the head team physician for the WNBA’s Atlanta Dream and is a rotational physician for U.S. Soccer national teams. “This is leadership one would expect from a sport’s national governing body,” he added. “USA Football is wise to do this. Progressive skill development also delivers greater physical literacy for young athletes, which benefits them in football and other sports they love to play. The FDM Council is comprised of specialists across medical and child development, long-term athlete development and football subject matter on youth, high school, college and professional levels. Its members represent The Ivy League, Children’s National Health System, the U.S. Olympic Committee, and others. “The FDM is an athlete’s roadmap – at any age – to enjoy the fun of football by participating in sport activities that are developmentally appropriate physically, mentally and socially,” said Dr. Brian Hainline, chairman of the FDM Council and the chief medical officer of the NCAA. School districts and youth organizations may pre-enroll to the FDM at no cost at www.usafootball.com/fdm for coach- and parent-centered resources.